Housing Action is a social enterprise working across Suffolk and Norfolk in the East of England, supporting and housing both individuals and families most in need. It is pioneering a number of innovative and cost effective ways of bringing empty homes back into use. click here to read the case study. “Amid all the gloom and doom surrounding funding for social housing, following the Comprehensive Spending Review, it’s encouraging to see £100 million has been earmarked to bring empty properties back into use” said Jon Fitzmaurice ” It’s not yet clear as to how this is going to be spent, but there’s every indication that there will be money available for Temporary Social Housing Grant. It’s an excellent source of funding for self-help housing organisations wanting to renovate empty publicly and privately owned properties and once the position is clarified we will pass on this information to the network”. To read the Government’s Housing Settlement document click here. St Mark’s Housing Co-operative provides affordable housing for 30 members on low or irregular incomes in West London and parts of East London. They take on temporarily vacant properties from local housing providers, often in a state of disrepair, clean and decorate where necessary, and use them to house members on a short life basis, for a minimum of six months and often for much longer. Full case study here. The South London charity formerly known as Advocates for the Homeless has relaunched as ‘PHASES’ (People, Housing and Social Enterprise Scheme). Over the past four years it has concentrated on developing construction training projects linked to empty property. Project manager Glenn Heaton said: “The change of name better reflects what we are about and the fact that we now help a wide range of marginalised people.” The charity’s most recent renovation, in Peckham, will feature on the BBC series ‘Britain’s Empty Homes’ in early 2011. The Homes and Communities agency is hosting a debate on empty property on their Showcase website. The debate ‘How do we maximise the use of empty homes?’ runs from 12th July – 30th and aims: “to address key challenges that local authorities face, highlight innovative practice and generate practical solutions to help the sector bring more empty homes back into use”. The Showcase website features a series of films from housing experts – including Canopy Co-ordinator, Steve Hoey – designed to spark debate around the issues involved in bringing empty homes back into use. Middlesborough-based self help housing organisation, Community Campus ’87, are the subject of a feature in the latest edition of leading regeneration magazine, New Start. The organisation was set up in 1987 in response to the housing crisis facing people aged 16 to 24 in northeast England and has since provided housing for more than 5,000 people. In the feature, New Start‘s Jill Theobald talks to Community Campus co-founders, Carl Ditchburn and Simon Virth, about over 20 years of successful work and the looming challenges from cuts in public spending. The New Start e-zine also featured a case study of a Community Campus volunteer. “The council has helped create 221 new homes from empty properties in the borough in the past two years, for renting by those on the council’s housing waiting list, and has also recruited a dedicated officer to work on the issue. Riverlink Housing Co-operative is based around North East London and has done some amazing work in rescuing properties bought-up in advance of road schemes, which would otherwise have been left to rot. Click here to read the full case study. 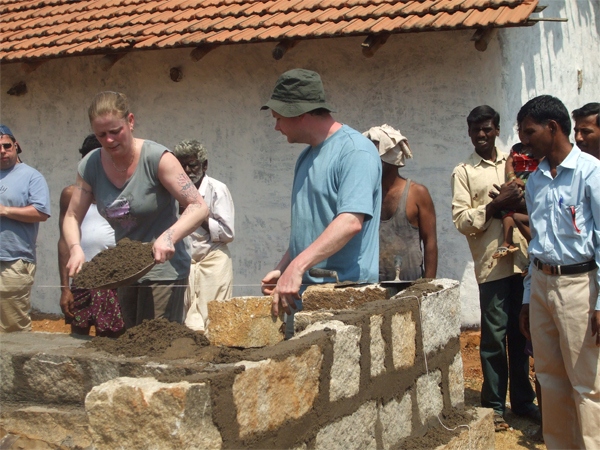 Not content with renovating empty properties in Stockton and Middlesborough, a group of people from Community Campus have just returned from a working trip to India, where they oversaw the building of a meeting room for a small rural community.